dromedary-marrakech A nice activity and original way to discover the Palmeraie, all for a very affordable price. What to do with friends and family: laughter guaranteed! From your hotel, we take you in the palm for a ride 1 hour camel. On the way, do not forget to admire the 150,000 palm trees that form the palm spread over 12,000 hectares and a production of dates and a vegetable garden. The story of the famous palm grove began in the 12th century when the dynasty of Almoravides Marrakech entered. These Berber rulers created the palm grove of Marrakech, a few kilometers from the city. At that time, certain species of palm trees were venerated as a symbol of life and fertility. Cultures were numerous and tree density allowed to guard against heat. To survey the park and find out what the is today, what better than a camel ride! Hiking camel we offer lasts 1 hour and takes you through the grove and oasis, past villas and Berber houses. Returning from this walk a mint tea will be offered. In short, a dream location, away from the rush of the city of Marrakesh to take a nice breath of fresh air! Warning, do this tour if you are pregnant or if you have back. 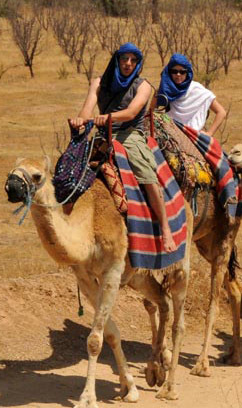 An excursion dromedary camel ride Marrakesh or Marrakech to spend a fun and exotic day that will mark your vacation! Ride a camel Marrakech is a very good tour to do in Marrakech without going to the trouble of going to the desert. Dromedary Marrakech palm grove: An activity not to be missed and an original way to discover the Palmeraie, all for a cheap price. Our camel ride back Marrakech allows you to experience the exclusive beauty of the Marrakech palm grove. perfect activity for a half day!